The West and East courses at Winged Foot Golf Club are the work of A.W. Tillinghast, one of America’s greatest golf course designers, and the West is Tilly’s finest creation. In a similar vein to many of the USA’s finest courses, you’ll need an invite to play here but persevere, because it’s worth it. The West is an amazing course, which is routed across fairly ordinary but heavily wooded meadowland. A few members of the New York Athletic Club founded Winged Foot in 1923 and the name originated from the athletic club’s emblem and now Winged Foot is synonymous with a everything American and it’s a true classic. Few designers could have pulled off Tillinghast’s amazing feat; he has created a serious golf course with no weak holes. Expect to use every club in the bag, Winged Foot's West possesses a number of severe par fours, ten of which stretch out well beyond 400 yards. The closing six holes are brutal, starting with the 13th, a 210-yard par three an followed by five par fours all measuring in excess of 400 yards. The closing hole is perhaps the best finishing hole in the USA and the 10th hole is one of the best par threes in the world. During 2016-2017 Gil Hanse restored the West course in readiness for the club’s hosting of the 2020 US Open, so we recommend you start buttering up one of Winged Foot’s members immediately. The marching orders were succinct and to the point -- "Build us a man-sized golf course." And architect A.W. Tillinghast dutifully fulfilled that request with not just one course -- but two. 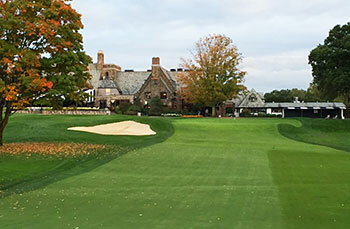 Winged Foot is a 36-hole layout located in Westchester County -- roughly about 45 minutes north of Times Square. The West Course has rightly earned a clear reputation as one of the most demanding of all championship courses and rightly so. Just six years after opening the West hosted its first US Open -- won by Bobby Jones in a 36-hole playoff but not until the Georgian had holed a testing 12-foot downhill curling putt on the final hole to get into the playoff. Other national championships followed but it was the famed '74 US Open -- dubbed, "The Massacre at Winged Foot," that forever etched in stone the reputation of the West Course. The winning score was 287 -- seven-over-par by a talented up and comer named Hale Irwin. The most recent US Open came in 2006 when several key players lost an opportunity to win the event -- the most notable being Phil Mickelson surrendering a one shot lead with a concluding double-bogey on the 18th hole. A 6th US Open is planned for the West Course in 2020. Unlike other notable courses in golf-rich Westchester County -- Winged Foot is on fairly mundane parksland. There is a bit of ground movement but no one would call it remotely hilly. The strength of the course comes with the utra-demanding putting surfaces. 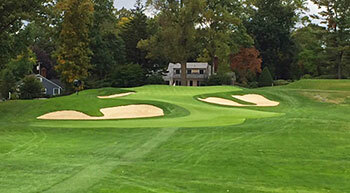 Tillinghast created pear-shaped greens with abrupt slopes from back-to-front. There are internal contours as well to contend with too. The greens are ably defended by flanking deep bunkers pushed ever so closely to the putting surfaces. Missing a tad either right or left results in demanding recoveries. Hitting too far into the greens to secure a more wider landing area can mean vexing putts await. In the '74 US Open Jack Nicklaus hit the 1st green in regulation -- having a birdie putt from 25-feet. His next putt was 28 feet coming back to the hole. Two additional putts had the Golden Bear flummoxed as he left the green. The West begins with a fearsome quartet of holes. There is no "warm-up" hole on the West. The opener is 450 yards and turns ever so gently right-to-left in the drive zone. The drive is demanding but the approach is even more so. Failing to land the approach near enough by the pin location almost ensures a quick three-putt -- akin to what Nicklaus endured. In the next three holes you encounter two additional long par-4's sandwiched between a demanding long par-3 that features a smallish green that looks even smaller as two bunkers push ever so close to the target. To make matter even more interesting out-of-bounds is right behind the green. In the '59 Open winner Billy Casper wisely layed-up in front and was able to make par with a chip and putt strategy. Since the West plays as a par-70 during key events it has only two par-5 holes and a quartet of par-3's. However, it is the strong two-shot holes where Tillinghast pushes the player to deliver time after time. Nine of the twelve are at 450 yards or more. Unfortunately, the club has decided to keep fairway widths close to 25 yards and the rough encountered is often dense and quite deep. Why this is done is beyond me. The West doesn't need to be "helped" given the inherent design characteristics. Unfortunately, there seems to be the belief among too many clubs worldwide -- Royal Portrush does similarly with Dunluce in Northern Ireland as does Muirfield in Scotland -- that additional demands must be included by preparing rough to be a full shot penalty. The recovery shot -- an element central to the playing of the game -- is then frankly eliminated unnecessarily. Widening the fairways in the range of 30-35 yards would add more versatility providing for more playable angles into the greens. The straight razor-cut fairways frankly only allow a predictable "one-way" dynamic and a number of the fairway bunkers are actually not in play because of rough that envelopes them and prevents stray tee shots from running into them. That's not to say there aren't interesting holes at the West. The short par-4 6th is often undervalued. At just 321 yards the bold play is for strong golfers to give it a go for the green. That's often the wrong strategy. The green is positioned like an upside down letter "L" with a sizeable and deep frontal bunker. Landing the approach on the green when the pin is cut anywhere near the right will demand the surest of wedge shots to both hit and hold the target. The long par-4 8th at 475 yards is another fabulous hole. The tee shot must be faded on this dog-leg right. The green, like the others, is ably defended and cannot be missed to either side. The inward nine at WF / West begins with one of America's best mid-length par-3 holes at 190 yards. Ben Hogan was famous for saying that hitting the 10th green was the equivalent in using a 3-iron to land into someone's bedroom. Named "pulpit" by the membership -- the 10th is something to behold when standing on the tee. Getting the right yardage is complicated because unlike the other holes on the West which go on a north-south axis -- the 10th runs in an east-west direction meaning unpredictable crosswinds can happen. 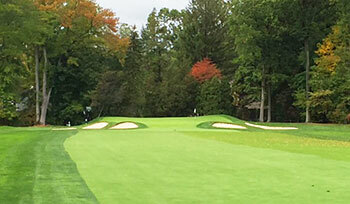 In order to bolster its reputation the club decided to extend the par-5 12th to 640 yards. The added length did not mean a better hole -- just one that mandated three predictable shots to reach the green. It is the final five holes where the West has earned its reputation as a stout no-compromising course. Each is a par-4 hole and none can be taken lightly when playing for a championship or just a friendly wager. The 14th provides a striking elevated green pad that like so many others on the West plays smaller than it appears. The par-4 15th is superb mid-length hole sliding downhill and then climbing to a magnificent green diagonally angled from lower left to back right. What many may not know is that Fred Corcoran -- the man responsible for the creation of what would become the modern PGA Tour -- had a house immediately adjacent to the green and when in residence would be quick to invite players to his home for a mid-round celebration. Some never returned to the course. The long par-4 16th adds even more demands -- mandating a very long and well-positioned tee shot on the dog-leg left. Played as a member's par-5 the hole again provides for a small putting surface ably defended by sand. The penultimate hole goes the opposite way -- calling for a controlled fade to a very deep and long green. The final hole -- aptly named "Revelations" -- is one of the strongest concluding holes in American golf. A lone right fairway bunker is there to push players back to the middle and is well-positioned. The approach must then carry a false front that can derail many a player. One need only ask Colin Montgomerie whose approach at the 72nd hole in the '06 Open came up woefully short after deciding to take one less club when Monty's original decision was likely the right call. The final green on the West is demanding to accurately read and arguably is the finest putting surface Tillinghast created. What makes the West so unrelenting is how difficult it is to get near the pin on so many holes. Without finding the fairways the wherewithal to hit greens in the regulation stroke becomes near impossible with the ever present coffin-like rough. The club sadly has decided to hunker down on the ornery side in terms of course preparation and, as mentioned earlier, is totally unnecessary, given the inherent elements Tillinghast beautifully created. Playability is compromised on the altar of sacrificing players with unyielding difficulty. A pity. Truly, less can be more in this specific instance. A couple weeks ago during an amazing golf tour I had the distinct honor of playing Winged Foot. What a special place enriched in golf history. Winged Foot has hosted several major tournaments in its history along with a few US Opens. It’s a true championship course with a challenging routing and some of Tillinghast’s most renowned green complexes as I would find out. To give an indication of the challenge Winged Foot presents the pros we only need to know that managing to finish around par usually wins the US Open here. My wake up call came early, in fact, right at the first hole which has a rather large green complex that slopes steeply from back to front, incidentally a theme that repeats itself throughout the course. However, the first green is quite extreme not to mention being super fast. Of course we hit it on a slow day where the greens were rolling about 12 on the stimp. I hit my approach on the first to about 10 feet above the hole and was quite happy till I arrived at the green and realized there was no way for me to keep the ball on the green. A putt, a chip and another putt later and I had learned the most important Winged Foot lesson. Stay below the hole, even if it that means playing the approach short of the green and chipping or putting from there. Being a slow, stubborn learner I’d make the mistake a few more times in the next few holes just to solidify the strategy in my head. The routing is wonderful and I loved the mix of long and short par 4’s and excellent par 3’s. It was also pretty special to experience first hand some of the tricky up and downs Winged Foot presents even with the slightest of misses. I can’t remember facing situations around greens so often where the only chance to get the ball close was to open up your 60 degree wedge and take a semi full swing in an attempt to throw the ball up high and land it like a wet tee bag on the green. The rough presents a real challenge but is also a point that I would be critical of. I would argue it should be trimmed back opening up the playing alleys, I don’t like to see the rough keep balls out of the bunkers, ie. hazards protecting hazards. The course is difficult enough that creating more space would greatly increase the fun and playability for members really emphasizing the use of strategy and angles of approach. The greens being as tricky and fast as they are already do wonders in “protecting par” for as far as that’s necessary. Finally, the finish at Winged Foot is second to none. The last 4 holes all play very tough. 17 is a long, dogleg right par 4 requiring a perfect drive on the short grass which leaves a long iron to fairway wood into a smallish green sloping left to right. 18 is a long dogleg left requiring another prefect drive and then a truly perfect approach into a crazily undulated green with a massive false front. Just add some excellent putting and you could walk off with par or better. As history would have it many greats have collapsed on this closing stretch and more specifically this last hole. Notably Mickelson and Montgomerie who both let US Open chances slide away here. An invite to Winged Foot is an opportunity not to be missed however, I will offer one solid piece of advice, pick the right tees for your ability. Trying to play this course too long may well result in a torturous round of golf. Great experience, thoroughly enjoyed the first class treatment and striding down the fairways following in the footsteps of current and former greats of the game.Yhe course was in suburb condition with some great holes especially 18. Overall I was a bit dissapointed with the course itself. Impossible to loose a ball (apart from drive on 15), East and West intertwine which takes away from the exclusivity and the requiste feeling of awe which one should be subject to when playing a course of this stature. Clubhouse is magnificant in everyway. As a major course I would say Bethpage Black is streets ahead. Played it in mid October 2010 - 68 degrees and sunny. Played off whites (6,650 yards), no run on the ball so was plenty long enough. Defining memory were the strong par 3's No. 10 a stunning hole (lipped out for birdie). 6th is short 320 yards but v v tricky approach to a very narrow entrance. Lot of dog legs so you need to move the ball both ways, expect to hit lots of fairway metals and rescue clubs for your second shot. That said I shot an 85 off a 14 handicap so ultimately playable. Played the West on Sept 3rd 2007, really a brutal test. Played the tips (76.1 rating) the day the club chanpionship final was being played, so the course was in optimum shape. Greens very fast and tough, narrow fairways and long, really long.Scored 81, had some bad holes but played ok. My best shot? Great 220yds 4 iron on 3rd 1m to pin and birdie. Worst one? Strong hook with driver on 11th, triple bogey.The final 4 holes will not only test your game, but character as well, Phil, Colin and Ogilvy showed it.When I stood on where Phil sliced his driver on 18th, couldn´t believe what he tried to do, crazy really crazy!! !A special paragraph to 320yds par 4 6th, very very challenging, went for the green, narrow miss and my 2nd shot was impossible, only from 50 yds. Next time better lay up and full wedge to very small and tough green. I have played both the West and East courses in the John G Anderson Memorial 4 ball.The East is a really good test but the West is just BRUTAL.The rough is frightening,the length is very long and the greens are scary quick,if you are on the wrong side of the hole forget it.I also agree that the last 6 holes on the West are the hardest finish you will find anywhere.Sadly as most of the great courses in the world,you can only play with a member.If anyone ever gets the chance to be invited,drop everything,and get the plane to New York,it is a must. A spine tingling experience just pulling up to the clubhouse, Winged Foot is special with a capital S. I know a member here and have been fortunate enough to play both courses on numerous occasions and each time is etched in my memory. It’s a monumental experience and a challenging course and deserves to be higher up in the rankings.